Weight 353g Sections (pcs) 2 Transport length 11.. Weight 324g Sections (pcs) 2 Transport length 15.. Weight 324g Sections 2 Transport length 158cm .. Weight 314g Sections (pcs) 2 Transport length (c.. Weight 248g Sections (pcs) 2 Transport length 13.. Weight 195g Sections (pcs) 2 Transport length 12.. ITEM NO: 49721 LENGTH: 198cm SECTIONS: 3 WEIGHT.. ITEM NO: 49722 LENGTH: 198cm SECTIONS: 3 WEIGHT.. ITEM NO: 43991 LENGTH: 223cm SECTIONS: 2 WEIGHT..
Light weight blank construction Korean carbon..
Bearings: 2BB + 1RB Gear Ratio: 4.2:1 Line Capac..
Tough rods for the toughest fishing! E-Glass combi.. 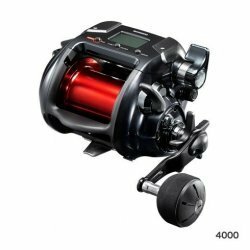 This reel is poised to be the new basic of powerfu..
TalicaTehtud kitsa keha printsiibi alusel, ..
Shimano Tekota 300 LCLaagrid: 3+1 Ülekanne: 4..
UUS 2019 AASTA TEKOTA! !Liiniloenduriga rull jä..
Shimano Tekota 700 LCMLaagrid: 3+1 Ülekanne: ..
TLDThere's nothing we can say about our ic..
Shimano Tyrnos 30 IILaagrid: 4 Ülekanne: 5.0:..
Reel is Right Handed.WFT DEEP WATER 10, the re..
WFT DEEP WATER 10, the reel for the sportiest typ..